Title: CN 6060 fan trip. Description: The firetruck filled her up. 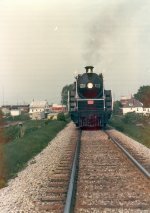 Description: CN 4-8-2 6060 waits in the passing track at Markham, Ontario on the evening of Firday June 4th, 1976 for the wedding party to return from church. They had chartered the train to take them to downtown Toronto for the reception. Description: What to do when there's no water tower? Call your friendly fire department! On the other side of the street, note the homemade El Camino / Ranchero, carved out of what appears to be a '65 or '66 rambler station wagon. Description: Niagara Falls station was (is) just a few tracks, pull in / pull out, with no loop, wye, or turning facility. 6060 is resting but pointed the wrong way - that will be fixed as soon as the RDCs depart. Description: No, 6060 is not about to wipe out that mopar - it has left Niagara Falls station, shoving against it's train (backing out) and has just cleared Church's Lane. 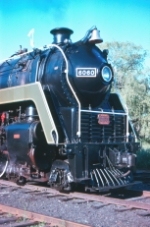 Description: After backing down past the switch, 6060 reverses direction and pulls through one leg of the wye. Note the reappearance of signal 315. Description: Not sure whether they took this route out of town or made the full reverse move to follow the RDCs, but the rain is now a deluge and I'm done. 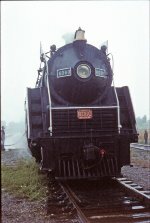 Description: Following her restoration in 1972-73, CN 6060 ran in regularly scheduled service for a couple of years out of Toronto. Round trips to Niagara Falls were run on weekends during the summer. 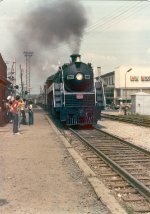 "Bullet-nose Betty" is seen here at Niagara Falls station after arrival from Toronto.